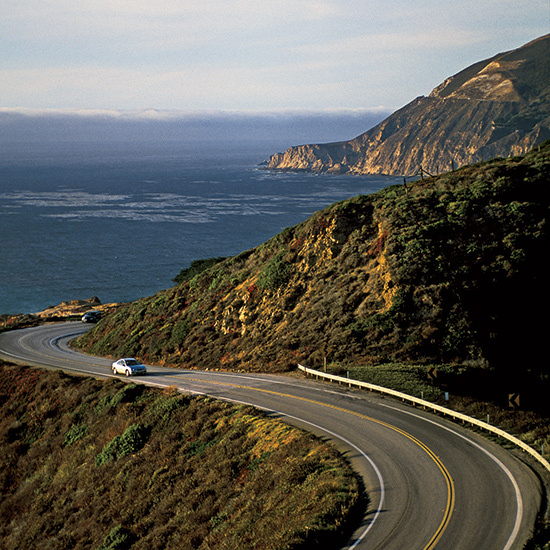 F&W Travel Editor Gina Hamadey tells you everything you need to know for a great California coast road trip, from where to eat oysters to the best roadside doughnut stop. Brake for oysters, pull over for doughnuts, park for Pinot Noir: F&W's Gina Hamadey maps out the perfect weekend drive along the California Coast. Highway 1 passes through the village of Mendocino, perched on a grassy cliff jutting over the rugged Pacific. At The Wine Bar[n] at Glendeven Inn, owner John Dixon pours 50 bottles from the local wine country, a half-hour drive inland. He charges just $10 for a white-wine flight and $15 for a red, focusing on small, hard-to-find labels like Shandel's Oppenlander. "We've become a tasting room for wineries that don't have one," Dixon says. glendeven.com/the-wine-barn. At the Heritage House Resort, guests lounge in Adirondack chairs on private porches, then head inside to rooms outfitted with fireplaces and large, lovely bathrooms. At $225 a night, this is a great deal. The new chef, Fabrice Dubuc—who grew up in Paris, working with his uncle at Le Train Bleu restaurant in the Gare de Lyon train station—serves bistro classics like steak au poivre. heritagehouseresort.com. Ten miles north of Mendocino is Fort Bragg's colorful Glass Beach. fortbragg.com. Gualala, an adorable seaside town, has a super-stylish home store, Placewares, that would be equally fitting in a big city like San Francisco. The shop now has a great food section, too: Caroline Ducato, a former cook at Chez Panisse, finds amazing local jam, honey and ice cream—plus, she organizes classes on topics like California cheeses or how to make desserts with gelato. placewares.com. Jam Fresno chile, pluot and Meyer lemon jams, handmade near Oakland. innajam.com. Toffee Burnt-caramel toffee bars by a top San Francisco chocolatier. pocodolce.com. Olive Oil Some of America's best, from orchards north of Sacramento. ooliveoil.com. Surrounded by cypress trees, the recently renovated Sea Ranch Lodge is situated on one of the highway's most pristine lookout spots. The wine list is serious—all local, and very affordable: There are about 50 bottles under $50 (like the 2012 Husch Sauvignon Blanc for $26). Pinot Noir is well represented, and even shows up in the Pt. Reyes oyster mignonette. searanchlodge.com. Stewarts Point Store sells specialty root beers and locally made chocolate chip cookies, as well as a mix of antique plates, camping gear (socks, sleeping bags), sandwiches (rosemary tri-tip on sourdough), and local wine and beer (Anderson Valley Boont Amber Ale is on tap). Last fall, co-owner Charles Richardson—whose great-great-grandfather ran the store in 1881—erected stylish canvas tents for rent ($150 per night), tricked out with queen beds, wood-burning stoves and outdoor showers with staggering views. stewartspointstore.com. Rarely is good wine made close to the Pacific (too cold and windy); a notable exception is Fort Ross Vineyard & Winery, which produces a fantastically lively Pinot Noir. Another benefit of the two-year-old tasting room's location: the panoramic view of the ocean, ringed by redwood and madrone trees. fortrossvineyard.com. Saltwater: Have a superfresh salad and rosé on tap Marin County is world-renowned for its farms and creameries, plus the extraordinary oyster beds of Tomales Bay. The casual-cool restaurant Saltwater takes advantage of all these stellar local ingredients. Farmers and fishermen bring salmon, lamb, lettuce and other foods right to the back door; chef Ryan Cantwell uses them in daily-changing menus—which often include a salad with a cumin-spiked blue cheese dressing. There are eight wines on tap, including the fruity County Line rosé. saltwateroysterdepot.com. Seven years ago, a fire ravaged Margaret Grade and Daniel DeLong's legendary Marin County retreat Manka's Inverness Lodge (guests Jake and Maggie Gyllenhaal escaped unharmed). With Sir and Star at the Olema, Grade and DeLong are back, along with their signature ultra-local dishes featuring poetic names ("A Soup of Annabelle's Acorn Squash Under a Small Cloud of Spiced Coastal Cream Crowned with a Confetti of Woodacre Walnuts"). sirandstar.com. Highway 1 cuts through the Presidio, a former US Army Post with views of the Golden Gate Bridge. Now there's a hotel, Inn at the Presidio, in the Georgian Revival mansion that once housed unmarried officers. "It's a refuge tucked away in the trees," says F&W Best New Chef 1995 Traci Des Jardins, who this spring opens The Commissary, a short walk from the inn. During the day, the restaurant stocks picnic goods; at night, it serves California- meets-Iberian dishes like white gazpacho. Doubles from $215; innatthepresidio.com. About an hour south of San Francisco is Año Nuevo State Park, where elephant seals and their pups gather year-round. parks.ca.gov. Big Sur—the most famous, most photographed section of the highway—hasn't had a new restaurant in years. So it was big news when Big Sur Roadhouse opened last summer. In the modern farmhouse, New Orleans–born chef Matt Glazer serves food the hippie village has never seen before—Cajun fare like po'boys—using local ingredients like sea bass. glenoaksbigsur.com. For AVA Santa Barbara, legendary winemaker Seth Kunin produces five wines, one for each of the five regions (or AVAs) of nearby Santa Ynez wine country. "Such a huge variety of grapes can grow here," he says. "It's like taking all of France and cramming it into 29 miles." avasantabarbara.com. After wine tasting, head to Blue Tavern. F&W Best New Chef 2011 Ricardo Zarate has three hit Peruvian restaurants in Los Angeles; at Blue Tavern, he's making good use of the restaurant's wood-burning oven for dishes like prosciutto pizza with burrata, goat cheese and huacatay—a mint-like Andean herb. bluetavernsb.com. Spend the night at the glamorous El Encanto (a onetime favorite of Clark Gable and Carole Lombard), which reopened in 2013 after a long renovation. The hilltop setting is the same, but everything else is brand new, including the grand pool and the most serious spa to open in California in years. Doubles from $475; elencanto.com. While in Big Sur, take a short hike to a stunning beachfront waterfall. hikinginbigsur.com. A guide to the town's best Mexican joints from winemaker and taco aficionado Seth Kunin. La Super-Rica Famous thanks to fan Julia Child, this place still turns out delicious stuffed-pepper tacos. 622 N. Milpas St.
Lilly's Taqueria Tacos here use every part of the cow; beef lip and tongue are specialties. 310 Chapala St.
El Bajio When the goat taco with handmade tortillas is on the menu, order it. 129 N. Milpas St. Quirky Venice Beach has one of the liveliest food scenes in L.A., including the always-packed Gjelina and the fun brunch spot 3 Square Café; the latest addition is Superba Food & Bread. The offshoot of the popular Superba Snack Bar serves Stumptown coffee and pastries both sweet (pain au chocolat) and savory (pimento cheese muffin). superbafoodandbread.com. "It's East Coast nostalgia with a West Coast vibe," says David LeFevre, the chef and co-owner of Fishing with Dynamite. He wanted to bring a New England seafood shack to his beloved surfing community, Manhattan Beach, and he obsessed over every detail: finding the blue-and-white Japanese buoys that hang from the ceiling at an antiques store in Solana Beach; cajoling his mother into giving up her recipe for Cape Cod squash rolls. The place has been a success thanks to the fun vibe and amazingly fresh food—from raw Peruvian scallops with yuzu to fish tacos with chicharrones to Key lime pie. Seafood-friendly wines from around the world (New Zealand, Slovenia, Austria) come in three- and six-ounce pours. eatfwd.com. After lunch in Manhattan Beach, take a 90-minute beginner's surfing lesson. campsurf.com. Everyone knows the best doughnut is the freshest. With that in mind, Sidecar Doughnuts & Coffee co-owner Brooke Des Prez pulls a batch from the fryer every hour. One of the most popular—Butter and Salt—is also the simplest, with cultured brown butter, buttermilk and fleur de sel. Des Prez uses quality ingredients (King Arthur flour, Madagascar vanilla beans) and no dyes or preservatives. "No shelf life," reads a sign. No matter: They go fast. sidecardoughnuts.com. Culture Brewing Co: Try San Diego's best microbrews Culture Brewing Co is the latest member of San Diego's trendsetting microbrewery scene. On tap are around a dozen simply named beers (Imperial Stout, Blonde) because the three owners think quirky names just serve to confuse people. "No funny names," says co-owner Steve Ragan. He met co-owner Dennis Williams in the plumbing aisle of Home Depot; both were looking for home-brewing equipment. Their hobby turned serious, and now they're on a mission to educate: A grid on the wall shows each beer's alcohol percentage, bitterness, color and type of hop. culturebrewingco.com. For nearly 90 years, the pale pink La Valencia has been the most elegant hotel in San Diego's prettiest village (La Jolla); it just got a $10 million refresh. Doubles from $250; lavalencia.com. A 15-minute drive south is Juniper & Ivy, new from Top Chef star Richard Blais, with a concept he describes as "farm to nitrogen tank to table." In the open kitchen, chefs make fresh pastas (a wink to the Little Italy location). juniperandivy.com.